Feature walls will add personality and style to a room. They are basically the one wall of the room that is given a standout texture, pattern or colour. Else the feature wall might be shelves for decorations. Tiles are a good option for a feature wall. While is it possible to decorate every wall of the room the results are often undesirable. Too much detail, too much decoration, makes a room feel crowded or small. But one feature wall with plain surroundings, or perhaps a full length mirror on an adjacent wall, can make a room look tastefully decorated. Moderation is often best. The look of timber adds warmth to a room. Timber tiles achieve the same look as real timber, but with the bonus of being waterproof. This makes them ideal for bathrooms. And a wooden décor bathroom can look very stylish indeed. A feature wall may be as simple as connected geometric shapes or as complex as a mosaic. Either can be effective, with even a single bold colour on the wall being enough to make the bathroom look impressive. Polished tiles have the advantage over other wall materials because the glossy surface makes the room appear larger. 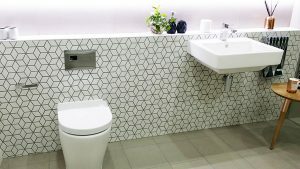 Modern tiles benefit from modern manufacturing techniques and large production runs. This means good quality tiles are cheaper than ever and available in countless styles. Take advantage of this and have the home tile décor you have always wanted.